Strong growth. Rising real estate prices. Rapid job creation. Surging immigration. This list sums up the Switzerland of 2014 down to a tee. However, it also sounds like a description of what things were like in Spain in 2007 – shortly before the country’s economy fell off a cliff. What follows is a conversation between financial journalist Detlef Gürtler and economist and crisis expert Edward Hugh about possible parallels and differences between the two booms, and the role of a new phenomenon which Hugh describes as “Hot Labour“. Hugh argues that this is a new phenomenon, and on the increase as a result of central bank bubble inducing activity. While immigration is a vital tool aiding economies to manage the population ageing process, it is important that economic activities be balanced. Immigration fueling boom/bust cycles is far from innocuous, and harm a country just as much as a sudden stop in capital flows if the immigration is followed by emigration. 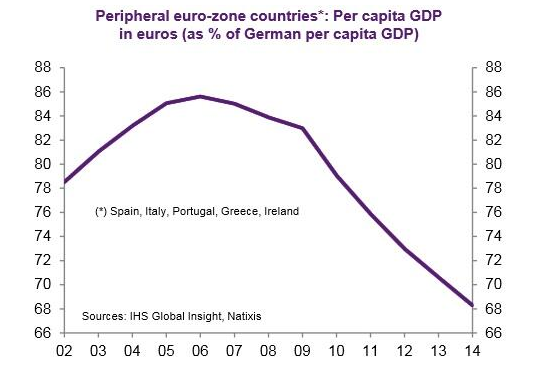 Detlef Gürtler: Well Edward, you personally lived through one of the most important real estate booms in European history – the recent Spanish one. 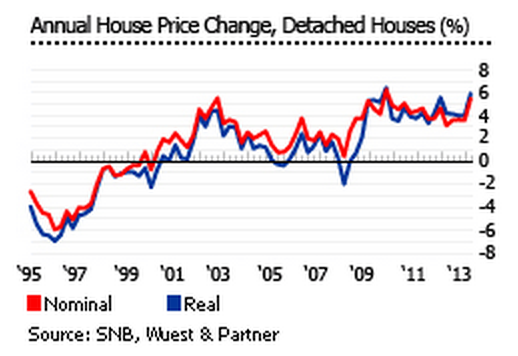 Is the real estate boom we are witnessing in Switzerland in any way comparable? Edward Hugh: Before I start, I think it’s worth pointing out that it goes without saying the Swiss are quite different from the Spaniards; and the Swiss economy is completely different from the Spanish one. In this sense every boom or crisis is in its own way different from anything before. That said, such “trivia” doesn’t normally stop economists like me from trying to draw comparisons, even if in this case I have to be extremely careful, since while I know quite a lot about Spain I know much less about Switzerland. So perhaps you will help me. Detlef Gürtler: Yes, economists do make comparisons, and you were even so bold as to draw one between the German 1990s housing boom and the one which took place in Spain after the start of the century. Edward Hugh: Well this comparison isn’t so strange as it may seem. Many talk today about Spain becoming the new Germany – in the sense of an export powerhouse – and while this idea may have a rather dubious basis in reality the shift from domestic consumption to exports is quite striking. In both cases the subsequent “regeneration” was preceded by a significant consumer boom, in both cases there was a strong increase in real estate prices including a construction boom, in both cases there was an increase in household indebtedness, in both cases the current account deficit deteriorated. And then in both cases there was a rude awakening. The only real difference was one of scale, and in this case scale is important. 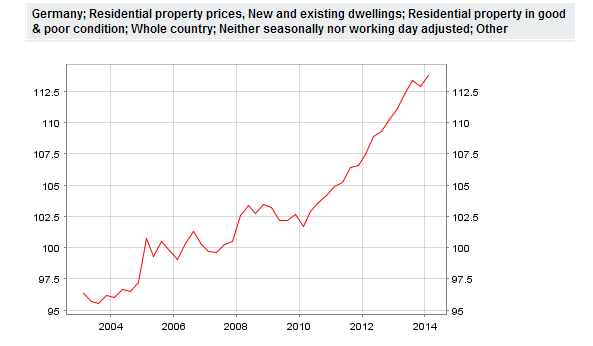 Spain had what was at the end of the day the mother of all housing bubbles. Detlef Gürtler: But in each case there was a completely different historical background and there were very different underlying motifs. Edward Hugh: Yes, of course. But does that really make a difference when it comes to economic ambition? East Germany’s citizens in 1992 – just like their Spanish equivalents in 2002 – saw how big the distance was between their consumption level and the western (or northern) one, and since they could in each case contract debt on what was for them fairly favorable terms they decided to put history straight and to carry out a rapid catch up in consumption. Really, Europe as a democratic political project has some of the responsibility here, since there was no equalizing mechanism put in place, but at the same time people felt they were entitled to similar living standards. Detlef Gürtler: The Germans, on the other hand didn’t find themselves with mortgages well below the actual value of the relevant property, while Spaniards are already facing this problem. Edward Hugh: No, you’re right, but this isn’t the whole picture. Weren’t there massive tax breaks for builders and developers in East Germany, tax breaks which were rapidly converted into 100% financing whereby the government effectively assumed the cost of write-down?. Detlef Gürtler: Only in the prospectuses of tax-saving-scheme promoters. In fact, many investors ultimately remained sitting on a mountain of debt, debt which was higher than the long-term obtainable sale price for the property. Edward Hugh: I see. In Spain, instead, creative valuation techniques were used. The economic end result is the same: you lose the property but get stuck with a large part of the debt. Detlef Gürtler: And how does Switzerland fits into this picture? Edward Hugh: Well lets start with something which at face value seems positive. 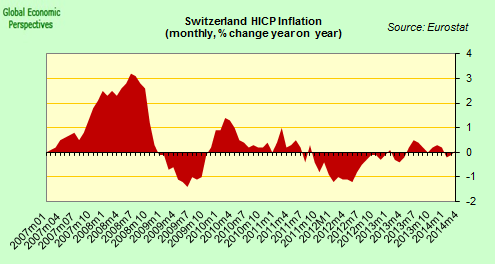 For many years there was virtually no inflation in Switzerland, sometimes the situation was more like deflation. Now a bubble economy without inflation, surely that would seem to be a novelty. Unfortunately, when you come to look into things a bit more it isn’t quite the novelty it seems to be. In fact Larry Summers, in his secular stagnation speech to the IMF 2013 research conference drew attention to this phenomenon. So it seems bubble economies without inflation are becoming more common. The big question is why. Detlef Gürtler: But if we look at real estate itself we see a different picture. In many market segments show annual price increases of more than ten percent. Edward Hugh: Well, that is presumably in no small part due to investors from around the world seeking a safe haven for their money in Switzerland. Detlef Gürtler: Yes. But especially since the franc was coupled to the euro these investors switched from the Swiss currency into Swiss real estate. Edward Hugh: And obviously this increase is not (or is only insufficiently) taken into account in the consumer price inflation rate. Here again we find a similarity with Spain where the large rise in house prices was not reflected at all in the official consumer inflation rate. So despite official price stability life feels like it is becoming significantly more expensive, especially for those looking for a new apartment. Normally when addressing the question of whether a real estate bubble exists or not, it is important to think about leveraging, about whether the home purchases are financed by credit. If real houses are paid for with real money paid, and this money comes from the outside, the economic effect could be seen as more economically similar to exports: A foreigner buys a piece Switzerland. If the price falls back, it is largely a problem for the external investor, not for the Swiss themselves or the Swiss banks. On the other hand, if all this “speculative” activity drives up property prices in a deflationary environment where wages are stationary, the affordability problem creates a different issue for Swiss nationals. Detlef Gürtler: And what about the British market? Would you say this is currently more driven by “irrational exuberance” than Switzerland ? Edward Hugh: Great Britain has at the present time the fastest growing economy among all industrialized countries. 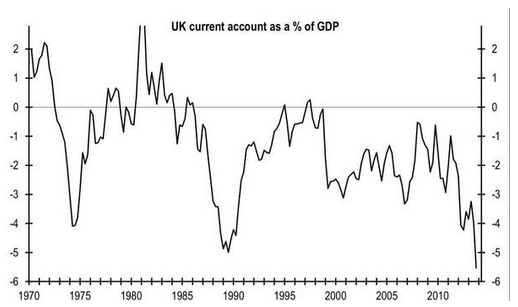 But why should Britain suddenly have become a stellar economy, an exceptional out-performer? Again all this euphoria in the UK really reminds me of Spain, since Spain in its day was also considered to be an “out-performer”, experiencing a major economic miracle. 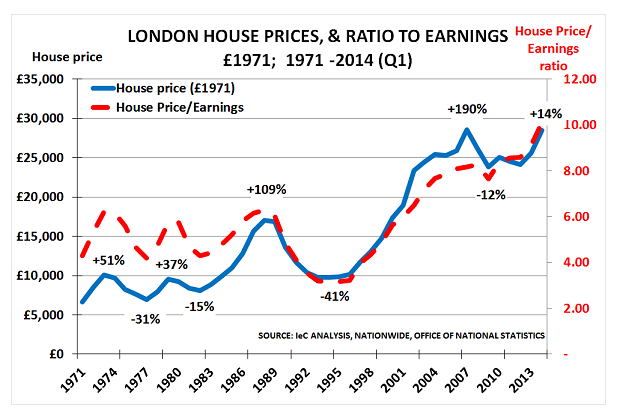 London house prices are up 18% year on year, and the current account balance is worsening. 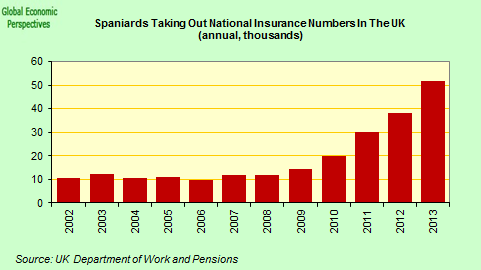 At the moment national insurance data indicate that roughly 600,000 economic migrants are arriving in the UK annually. Not as many as in Spain during the boom times – either in absolute terms or proportionally – but still a significant number. Because the immigration is mainly focused on London, it is leading to large distortions which affect the whole economy. The new arrivals need homes, but naturally they start without work and are not looking to buy. They end up renting – in maybe groups of 3 or 4 – and are thus able to collectively pay rental prices which a normal family cannot afford. Hence the buy to rent business become interesting. Sadly many of the young Spaniards arriving (maybe 60,000 a year) are fleeing the consequences of one bubble only to inadvertently fuel another. Detlef Gürtler: But isn’t this an example of exactly the kind of labour mobility the EU in general and (the euro zone in particular) wanted to see? People move from countries and regions were there is little work to those where there is plenty? This pattern of behavior was legendary in the USA. Isn’t it good that it now comes to Europe? Edward Hugh: Well, yes and no. The key point is that the employment growth needs to be sustainable. Look at Spain, nearly half a million former immigrants left the country last year. And yet one more time it is important to understand that Euro Area countries have a different set of institutional arrangements to the ones which apply to US states. When Detroit went bust, the Federal Government was there to act as backstop. When such activity is not sustainable there is a self perpetuating component which is highly undesirable. As Londoners feel better off since the value of their home has risen the borrow and spend more. They become more leveraged. This boost to economic activity in turn attracts new immigrants, which push up rents even further and with them property values, making Londoners feel even richer, and so on. As a result you get what you could call an unbalanced but self-reinforcing economic recovery. Hence the “superstar economy” aspect. So the point is that while developed economy societies need positive migration flows as they age, they don’t need just any old kind of flow, otherwise you could end up with problem bigger than the one you started with. Detlef Gürtler: Thus, labor mobility has a procyclical effect. Where the economy runs well , the process works through increasing migration with everything getting better and better and better, until that is the day bubble bursts. Edward Hugh: What we are talking about here is a new phenomenon. When people say our economies are becoming “bubblier” they normally are thinking in term of financial flows. This is the area first are in which the self-reinforcing dimension of the process was evident. Think of what happened to small countries like Iceland or New Zealand in the run in to the global financial crisis.The Danish economist Carsten Valgreen coined the phrase global financial accelerator to describe what was happening. Detlef Gürtler: You mean the way in which large speculative inflows produced a boom, which the respective central banks tried to contain by raising interest rates, but somehow these increases in interest rates only served to attract more speculative funds. Edward Hugh: Yep this was the the original pattern, but it’s different now. This is in fact the most important thing which has changed since the German property boom of the 1990s. Migration flows have started to play a role which is just as important as the financial flows one. The migrant flows we are seeing today are exceptionally large, and have the characteristic that – just like capital flows – they may reverse rapidly. You could call this the global labour flow accelerator. I am convinced that we are dealing here with something new, with a hitherto hardly recognized phenomenon – namely speculative labour flows, or if you prefer” Hot Labour “. Detlef Gürtler: “Hot Labour “? Never heard of it . Edward Hugh: Neither had I, till I saw what was happening in Spain. As we mention above, I started speaking about this in 2006. Detlef Gürtler: Did you invent the expression yourself? Edward Hugh: No, I got the idea from someone called Pepe . Detlef Gürtler: Pepe ? Which Pepe ? Edward Hugh: Well I don’t know him personally, or even his full name . Pepe was a commentator who showed up on my Blog. He used this term to distinguish those immigrants looking for a new home, a new life, and a new society to integrate in, from another group, those just moving for work or adventure without for any clear plan. Locate work quickly, and if a crisis hits then change country. Possibly this is not a conscious initial decision, but this is how it works out in practice. Many young Spaniards working now in London or Berlin seem to fit this category. They don’t really plan to emigrate, they just want to survive what they perceive as a “difficult period”. If asked in a survey about how they see their future they will normally say they are working abroad “temporarily” and will eventually return home. In fact they may never return home, emigration is a process which is not the product of a firm initial decision, but they also may be forced to move on quickly if the economic recovery where they have foudn work becomes volatile. So the distinction between immigrants and Hot Labour could be thought of as following the same pattern as a similar one which describes in capital flows, where people have long distinguished between foreign direct investment and speculative investments , as in the expression ” Hot Money “. Detlef Gürtler: In the case of capital flows it is not so hard to differentiate one from the other : direct investment normally relates to plants and machinery, Hot Money is normally associated with securities such as stocks and bonds. How would you differentiate the various migrant populations? Edward Hugh: First of all : not at all. The vast majority of immigrants change countries for economic reasons, but this does not tell us anything about whether and how quickly they will leave the destination country if an economic crisis breaks out. Detlef Gürtler: What would be ” fast ” in migration dimensions? Edward Hugh: Well you could say a “fast ” wave of migration today is one which turns around in a period of say five years. Previously such waves were conceptualized in terms of generations. So now we should really not take for granted that all the immigrants who come in a boom phase will remain in the country in the longer term. Detlef Gürtler: As were the experiences with the boom and crisis cycles in Germany and Spain? Edward Hugh: The 1990s German phenomenon largely predates the modern phenomenon. At the end of the nineties immigration stalled but hardly reversed. This was probably largely due to the noticeable influx of people of German descent coming from Eastern Europe – they came because there was an opportunity to do so, but they were more like classical immigrants, they came to stay. But now we are seeing a different phenomenon in Germany, suddenly we have seen a shift in the direction of migrant flows. During the early years of this century the number of people leaving Germany and the number arriving more or less balanced. In 2008 and 2009 in fact more people left than arrived. But since 2010 the number arriving (and the difference between those arriving and those leaving) has steadily increased. The result has been that the German population, which was expected to start falling, is now rising. And since most of those arriving are in younger age groups the same is true of the working age population. Provisional estimates from the German Statistics Office, suggest 1.226 million people emigrated to Germany in 2013, an increase of 146,000, or 13%, from 2012. The last time immigration on this scale was recorded in Germany was in 1993. 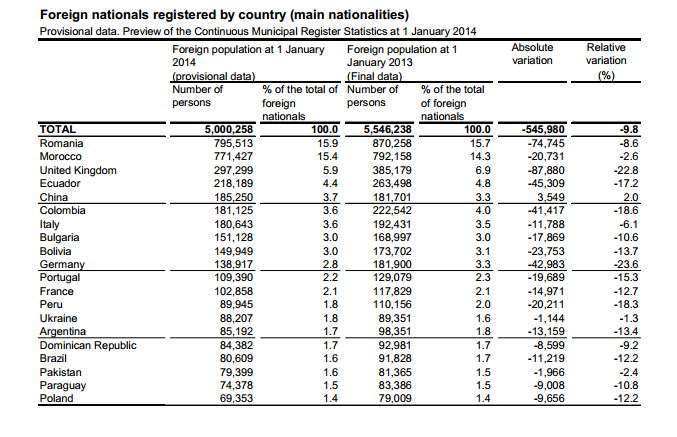 On the other hand some 789,000 people left Germany in 2013, 77,000 (+11%) more than in the previous year. The result was net immigration of 437,000 – also the highest figure since 1993.Naturally such a large number of people entering is producing a pressure on property prices in just the same way as in London, especially in Berlin and Bavaria. Detlef Gürtler: How does this recent German experience compare with Spain? Edward Hugh: In Spain, both the growth and the subsequent decline have been very rapid. 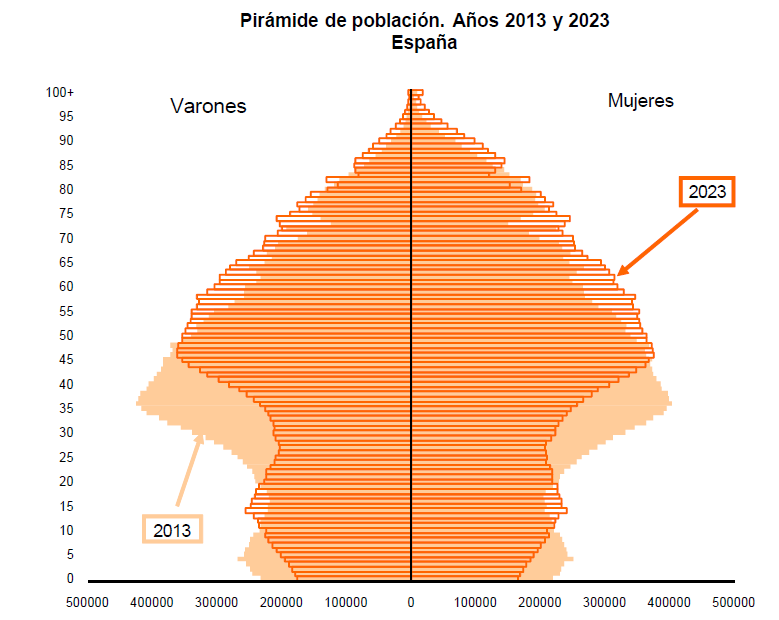 Between 2000 and 2010 the Spanish population grew by more than fifteen percent, from 40 million to 46 million. 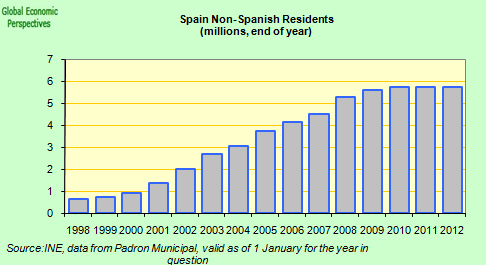 The number of non Spanish nationals in the country rose sixfold – from one million to 5.8 million . Now all of this has completely inverted: in 2013 alone approximately half a million people left, most of them former immigrants. The National Statistics Office estimates that the country’s population could fall by 2.5 million between now and 2023. The long term consequences for Spain, and the Spanish economy are hard to foresee at this point, but they are hardly going to be positive. 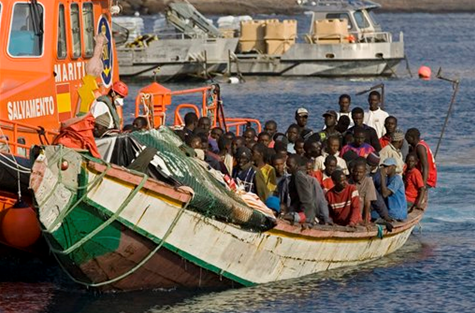 On the other hand people continue to arrive in Spain, principally from sub-Saharan Africa. This is a more classic immigration trend. People are not simply coming for work, they are also coming in search of a new life. Even though economic conditions are difficult most of these will stay and eventually take their lives forward. Detlef Gürtler: Was the initial intention of most of the migrants who came to Spain during the first decade to stay? Edward Hugh: I would say for the majority this was not initially the case. Back in 2002 I interviewed a group of Bulgarian immigrants about their intentions. The results were predictable enough. Certain groups who might have felt themselves disadvantaged in their own country – women, gays, religious minorities – wanted to make a long term change, but the majority felt they were in Spain temporarily, to earn some money and go home. This is what most of the literature on the topic explains. But most of the people I interviewed are still in Spain. This is normal. Time passes, you put down roots. Finally you have no real “home” to go back to. Actually I would say that personally this is my own case here in Catalonia. A somewhat similar phenomenon can be observed among the large number of female care and domestic workers who arrived from Latin America. This immigration was also a new phenomenon, since the women who arrived had largely been married and had children who were being looked after by grandparents. They sent virtually all their earnings home every month, possibly to buy a home. Some of these women have now left, but since caring for elderly at home is a growing occupation in Spain, and many Spaniards are reluctant to do it, the majority are still here, and increasingly they bring their children to Spain to live with them. But many of the immigrants from Latin America , Romania and Morocco were employed in the construction industry and services sectors like bars and restaurants are leaving in large numbers. How long can they support themselves in a foreign country without work? So despite the fact they might prefer to stay, many are now leaving. Detlef Gürtler: And how does all this compare with Switzerland ? Edward Hugh: Well in immigration terms Switzerland has a net population growth of about one percent per year (most European countries have very little natural population growth), putting it somewhere between the nineties German value (of about 0.7 percent per year ) and the most recent Spanish one (about 1.5 percent growth per year). Detlef Gürtler: Yes, and the immigration trend has recently accelerated. Already it is noticeable that something more than a normal recovery phase upswing is in motion. The older Swiss learned in school that their country had around six million inhabitants. The younger ones found the number had already risen to seven million . In 2013 we found that for the first time the country had more than eight million inhabitants, and many forecasts now predict that the number can easily reach nine million. This in a country with a total fertility rate of around 1.5. What Spain has shown us is that such trends do not necessarily last forever. Anyone with high rates of immigration and a nicely booming economy should also consider that substantial outward migration can occur when the economy weakens. If we are talking about a boom-bust then naturally things are much worse. Sustainability has to be a key idea we get our heads around in this context. Detlef Gürtler: Unless, of course, the immigrants had come to stay, as was once the case in Germany , with the German-born migrants from Eastern Europe. Edward Hugh: Yes, but this doesn’t seem to be to be the Swiss case. Switzerland is very open when it comes to labor flows when there is work, but much less open when it comes to the subsequent integration of migrants. Detlef Gürtler: And with an extremely liberal labour market jobs in Switzerland can not only be created very fast, they can also be deleted very quickly. Edward Hugh: Which makes Switzerland quite vulnerable to a Hot – Labour type phenomenon, with the capacity for a very rapid job creation phase followed by a rapid job destruction one. If that were to happen, then people shouldn’t be surprised if an economic downturn transforms itself into a veritable downward spiral. When there is work, the new migrants are made to feel somewhat welcome, but when they are without a job, just how much support is available for them? Very little it seems. Detlef Gürtler: So it’s like a game of Monopoly, where at some point you simply get sent back to “Go”, the original starting point. It looks like in Spain at the end of the recession many economic data looked more like those of the year 2000. Edward Hugh: Would that you only got sent back to the starting point! On some indicators – unemployment for example – Spain by 2020 may still be worse off than it was in 2000. The age structure would be another example. Those currently leaving the country in droves in order to seek employment elsewhere are predominantly young and well educated. Those who remain are either older,or without either skill or qualification. There is a massive human capital loss, and population ageing is accelerated. Detlef Gürtler: How do such movements affect things like pension systems? Edward Hugh: Well the initial inward surge is, of course, very positive. Pensions look much more sustainable, but if things go wrong then suddenly they aren’t and pension reforms become urgently necessary. Spain has now had two of these since the crisis started. Detlef Gürtler: But that is looking at things from the point of view of the receiving country. What about the sending one? Edward Hugh: Well obviously, migrants moving from countries with very low fertility – like Eastern and Southern Europe – leave a serious hole behind them. One which threatens the future of the pension systems there. Switzerland, with its island type location and the very Hot – Labour type context can simply wring its hands over the situation as people who have contributed to the welfare system for years suddenly leave. But in the European Union, with its formal commitment to some sort of a politically shared project, there will inevitably be pressure for another kind of solution, one which involves some sort of common pension system. People in the UK are want to complain about EU labour mobility, and arrivals from Eastern Europe, but countries like Latvia, for example, are hardly going to be sustainable if something isn’t done. It seems to me to be quite irrational for a country to enjoy a boom as a result of immigration, one which in addition means many urgently necessary structural reforms are pushed aside, while another country suffers only the negative consequences of emigration, getting stuck in a long depression while the entire pension system is pushed towards collapse. And then just a few years later the economic situation and the migratory pattern rotates one more reproducing the twin picture of complacency and collapse . Detlef Gürtler: The technical term for the EU institutional change you mentioned is “intra-European Compensation”, which probably means what the Germans call “Social union “. Edward Hugh: Right. If the Euro and the EU are to continue then this would seem to be inevitable. Or do you expect the Germans to declare that they, in the future, will maintain their pension level thanks to the contribution of Spanish immigrants? And that this outcome is socially just, just because so many Spaniards have benefited from coming to Germany and are willingly depositing their contributions in the German pension box to show their gratitude? But wouldn’t it be totally economically irrational that a common currency which is set up with totally inadequate institutional support, which overseas the generation of economic imbalances that cannot be corrected via either currency appreciation or depreciation, simply washes its hands of the search for a just solution. Other mechanisms must be established to allow these countries to recover and restore some sort of balance. Detlef Gürtler: Balance? But don’t many agree with George Soros when he argues that financial markets don’t tend towards equilibrium, but fall into boom-bust cycles over and over again. Can it be that the the markets for human capital behaves similarly? Edward Hugh: That could be, and that is the phenomenon I would like to draw attention to. However, the possibility has not been sufficiently explored so far, so let’s just leave this outcome today as an “educated guess”. But whether we are talking about booming labor markets, like Germany, Switzerland, Great Britain, or busted ones, like those in Spain and Greece we are producing a lot of data with which it should be possible to either confirm or refute the conjecture. And one last closing point. I have long favored (and continue to favor) sustainable immigration as one way to manage population aging (see my Message To Central Bankers Target Median Ages! : 2006, or my reply to Marty Feldstein “The Effects of the Ageing European Population on Economic Growth” of the same year). But for such a policy to work as intended we need to stop trying to reflate economies which for demographic reasons are trying to disinflate, and develop policies which are appropriate to the times we live in. The first step along this road is recognising that we have a problem. The above is an adapted translation from German of an interview which originally appeared in the magazine GDI Impuls.